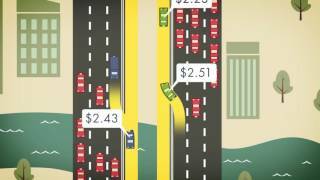 //Powerhouse Animation worked with local advertising agency Zellmer McConnell to create an explainer-style animation about the MoPac Improvement Project for the Central Texas Regional Mobility Authority.. This video elegantly explains the new construction and changes to a major highway in Austin, which gave us the opportunity to show off our local expertise. Austinites love music & tacos, but we hate traffic. So for us, this was a perfect job. Zellmer McConnell wanted to create an informative explainer video to answer the question “how are we going to fix Austin traffic?” Our talent with motion graphics and familiarity with the highway in question lent us the expertise to create an easily understood explainer video. We used Illustrator to create assets, which we then animated using After Effects. The end result: a concise and informative solution for a traffic-weary population.